Hassan Nasrallah’s stirring and impassioned defense of Damascus despot Bashar Assad went far beyond the Hezbollah chief’s by-now expected bravado. This was something intrinsically different. Nasrallah is a proven master at toying with the emotions of both supporters and foes in Lebanon. This time, though, and perhaps for the first time, he displayed genuine emotion. It may have been Nasrallah’s usual braggadocio when he vowed to stay in the Syrian conflict “to the end of the road” and to bring victory to his beleaguered ally Damascus despot Bashar Assad. But the significant portions of his harangue were those in which he listed the consequences to Lebanon if Assad should fall. Nasrallah predicted a catastrophic outcome, from his point of view, in such an eventuality. He said Lebanon would be the next to cave under. The subtext is that Hezbollah would collapse in the Lebanese content. His Shi’ite organization would, in other words, lose its stranglehold over Lebanon. It was always apparent that Assad was Hezbollah’s patron and benefactor. But now Nasrallah had admitted in no uncertain terms that Assad is not merely an ally but an indispensable mainstay. Hence Nasrallah must do absolutely everything to keep Assad in power, because Nasrallah’s own power hinges on that. The fates of Assad and Hezbollah are one and the same. If Assad loses his struggle to maintain its sway over Syria, Hezbollah would lose its ability to maintain its sway over Lebanon. Hezbollah is not merely repaying a trusted confederate; Hezbollah is waging the ultimate fight for its power base in Lebanon. If ever definitive corroboration existed for the crucial deformative role played by Syria in Lebanese domestic affairs, this is it. It is Nasrallah’s proclaimed strategic doctrine. The inseparable tie between Assad and Nasrallah – the two regional malefactors – is now not merely a matter of deduction, cogent as it may be. Their life-and-death symbiosis is out in the open, explicitly acknowledged, and implemented in Syria’s killing fields. Nasrallah keeps pouring more and more manpower into Syria and anti-Assad forces have now aimed their rockets at Hezbollah’s stronghold in Beirut. Just as Syria is considered a legitimate battleground for Hezbollah, so its Syrian enemies are likely to consider Lebanon a legitimate target for retaliation. Nasrallah has compelling reasons to fear that Assad’s defeat would send his enemies into Lebanon to root out the last vestiges of Assad’s prime accomplice, i.e. Hezbollah. This is not a conflict of choice for Hezbollah but a desperate fight to the finish. Hezbollah’s investment in Assad’s preservation has now superseded all its other agendas – including its enmity for Israel. The attacks – attributed to Israel – on convoys transferring weapons of mass destruction from Syria to Lebanon appear to bother Nasrallah remarkably less than the fear for the future of the Assad regime. Hezbollah is not, of course, the only player in Syria’s immediate vicinity that has a vested interest in safeguarding Assad. The biggest stake in Assad’s well-being is held by the godfather of the pro-Assad axis – Iran. To a great extent Hezbollah is fighting as Tehran’s surrogate. It does what Iran cannot directly do – openly dispatch combatants to fight Assad’s fight. Iran doubtless has contingency plans in the event that Assad should lose. For the ayatollahs, his fall would be a very bad blow but not a fatal one. For Hezbollah, Assad’s fall would spell its own. Hezbollah stands to lose everything and this is why it is fully embroiled in Syria’s civil war. Not only can Hezbollah act as Iran’s proxy but it has no option but to do its utmost to tilt the scales in Assad’s favor. 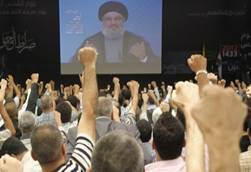 Nasrallah’s fiery oratory notwithstanding, his organization faces odds it never encountered in the past. It is not only pitted against Israel and domestic Lebanese opponents. The entire coterie of fanatic Sunni baddies from all around the Muslim world both castigates and actively opposes it. Hezbollah is more vulnerable and far weaker than at any previous juncture. This is a heartening development for Israel and a welcome byproduct from its policy of non-intervention. I think Hezbollah is in a lose-lose situation Sarah, especially if it gets embroiled in a conflict of one kind or another with Israel. Assuming our leaders do the right thing this time (and not toy with them like in 2006), they should have their skulls cracked wide open and not just end up with only the bloody noses they suffered back then. Dear uncle…I love your poetry ! Yes Sarah, this is a big advantage for Israel…a STRATEGIC advantage ! NOW Iran can no longer count on its allies Syria and Hezbollah, to lash out against Israel in retaliation ! Lieberman just yesterday declared, that Iran has CROSSED ALL RED LINES ! He just stated the OBVIOUS !!! You were correctly concerned by a few Irish school kids commenting inaccurately on Israel and Palestine. ood In that instance it is good you have been nowhere near the National Maritime Museum of Ireland. This is a short video from their latest exhibition. If you require any additional information, I’d be pleased to assist. Unfortunately, Assad also has Russia’s support. That appears to make the outcome unpredictable, especially if he Europeans and the Americans continue to withhold their support. the weaponry needed by the fractured opposition. What can Israel do in this situation? The amusing aspect of this is that Hezbollah is getting its head handed to them by a rag tag bunch of college kids with stolen guns and no clear discipline or strategy. The ‘mystique’ of Hezbollah, which is as important if not more so than the material successes of Hezbollah is gone. Hezbollah touted their fight with the IDF as a great victory because in their mind anything short of complete failure is a great victory. And to be fair the IDF played by the polite rules of war, appearing not to take it very seriously. When Hezbollah is finally confronted by ill trained people who are as savage, ruthless and suicidal as they are, they get crushed. And why is that? Because Hezbollah is still fighting a political war. If they lose the fighters go home. If the people they are fighting lose, they and all their friends and family are erased from the planet forever. The Syrians are fighting a tribal war of extermination, Hezbollah is playing politics so that they can continue to steal whatever’s available to steal. Big difference. Good article, Sarah. But assuming that the Syrian Al-Qaeda rebels topple Assad, and Hezbollah disintegrates, with reprobate Nasrallah fleeing to Iran; who will fill the vacuum in Lebanon? Al-Qaeda? A U.N. peace-keeping force? Or would Israel occupy Lebanon, and install a friendly government?